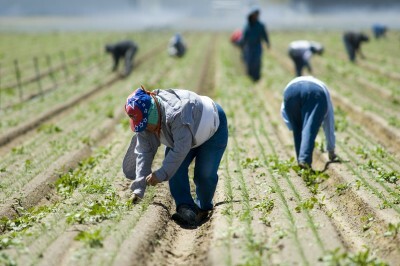 Thousands of farmworkers in the San Quintín Valley of Baja California, just 185 miles south of the U.S. border, struck some 230 farms, including the twelve largest that dominate production in the region, on March 17 interrupting the picking, packing, and shipping of zucchini, tomatoes, berries and other products to stores and restaurants in the United States. 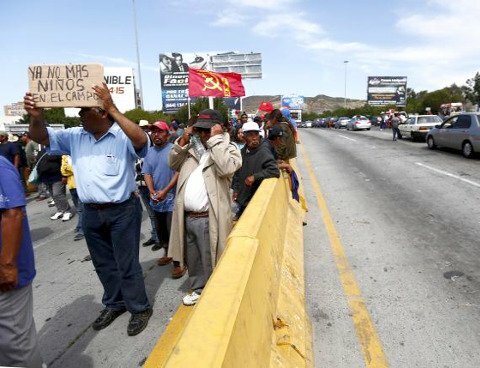 The strikers, acting at the peak of the harvest, were demanding higher wages and other benefits to which they are legally entitled such as membership in the Mexican Institute of Social Security (IMSS), the public health system. While there have over the last two decades been several large scale protests by workers in San Quintín, usually riots over the employers failure to pay their employees on time, this is the first attempt by workers to carry out a such strategic strike. The farm workers reportedly succeeded within three days in negotiating with employers and the government an agreement of the existing unions, the Confederation of Mexican Workers (CTM) and the Regional Confederation of Workers of Mexico (CROM), both corrupt organizations affiliated with the ruling Institutional Revolutionary Party (PRI) that had colluded with employers to keep wages low. The agreement reached on March 20 will give the workers the right to create their own union and negotiate directly with the owners. If this agreement holds, it represents a tremendous achievement for these workers and establishes a precedent for other workers throughout Mexico who would like to get rid of their corrupt government- or employer- controlled unions. The strike and negotiations over wages and other issues continue. While there is peace in the valley at the moment, the Mexican government has for decades deployed the army and police against miners, electrical workers, telephone workers, and any others, and it is altogether possible that they will send in large forces to break this strike. The ability of these workers to hold their ground will depend upon solidarity from other workers in northern Mexico particularly in Baja California and Sonora. Farmworkers march during a demonstration in San Isidro on the border between the U.S. and Mexico. The strike was organized by the Alliance of National, State, and Municipal Organizations for Social Justice (AONEMJS or Alliance) made up of indigenous groups from Chiapas, Oaxaca, Guerrero, and other areas whose members work in the San Quintín Valley. The Alliance combined a call for a general strike in the valley’s fields with the blocking of the Trans-Peninsular Highway that leads north to San Diego, California. Creating roadblocks and burning tires along a stretch of some 120 kilometers of the highway, they succeeded for 26 hours in stopping the delivery of the ripe produce to markets in the United States, with immediate repercussions for grocery stores and restaurants. Costco, for example, reported that its shipments were down. Strikes also seized government buildings and a police station. The Mexican government sent hundreds of federal police and soldiers to open the highway, which they did using tear gas and rubber bullets as well as clubs and curses. Strikers responded by throwing stones at the police. Reportedly 200 were arrested. Baja California Governor Francisco Vega de Lamadrid traveled to San Quintín to begin negotiations with the employers and with the Alliance. The San Quintín Valley has over the past couple of decades been transformed into one of the most productive agricultural regions of Mexico where large scale irrigation systems, modern buildings, and large scale truck transportation have been combined by employers with low wage indigenous workers to produce an abundance of fruit and vegetable for American consumers – hundreds of thousands of tons of berries, tomatoes, and vegetables each year – and to make fortunes for the transnational and Mexican companies that own and manage the farms. Many Baja California and Mexican government officials are actually owners or investors in the twelve largest farms as well as in some of the smaller one. Former Mexican President Felipe Calderón, for example, is an investor in one of the companies. The near fusion between corporate executives and the Baja California government has made it difficult for workers to achieve even the minimal wages, benefits and conditions to which they are entitled under the law. Last December The Los Angeles Times published a series of articles and produced a video revealing workers’ onerous conditions in San Quintin in December. As a result of those articles, Wal-Mart and the Mexican government announced joint program to improve farm workers lives, but apparently the workers thought they should take matters into their own hands. Some estimate that there are as many as 80,000 workers in the valley, though other estimates put the number at closer to the 42,000 registered permanent workers. According to one report only 11,000 of those workers, mostly employed by the transnational companies, have enjoyed IMSS health benefits. BerryMex, for example, which is affiliated with the American Driscoll company, registers 100 per cent of its employees. Affiliation with the Mexican Institute of Social Security (IMSS) from the first day of work at a company and medical coverage for both the worker and his or her dependents. Payment to workers of all benefits due under the law. After eight hours of work, double pay for each additional hour and tripe pay after more than 10 hours. Maternity leave for six weeks during pregnancy and for another six weeks after birth for pregnant workers. Five days of paid paternity leave for men. Measures against reprisals toward workers involved in protest. Payment of all benefits of the law to workers (one day of rest per week, holidays, and other benefits). Establishment of a state minimum wage for agricultural workers of 300 pesos per day. An increase of pay to 30 pesos for each box of strawberries (since 2001 workers are being paid 10 or 12 pesos per box). Double pay on Sundays and holidays. An increase to 17 pesos for bushels of blackberries, double on Sunday. An increase to 8 pesos for a bucket of tomatoes. Dan La Botz is the editor of Mexican Labor News and Analysis as well as a co-editor of New Politics where this article first appeared. This article draws from reportage in La Joranada , The Los Angeles Times , Los Ángeles Press , and other publications.